Macular degeneration is a common eye problem that is a particular risk for individuals aged 65 and older. This condition is not known to cause complete blindness, but it can seriously distort vision. Macular degeneration develops when damaged retinal tissue gathers on the macula and causes it to break down. As the macula breaks down, the vision can be impaired to the point that it is difficult to perform day-to-day tasks. Once macular degeneration develops, the damage that is caused is irreversible. However, if the condition is diagnosed and treated early on, doctors can prevent further damage. With early intervention, our retinal specialists at EyeCare 20/20 can provide macular degeneration treatment that allows our Mandeville, LA patients to preserve clear vision. If any these symptoms are present, our eye doctors can perform diagnostic tests to determine if macular degeneration is present. Once a diagnosis has been made, our doctors will discuss your treatment options. Dry macular degeneration: Dry macular degeneration is the most common form of this condition. Most cases of dry macular degeneration are treated with dietary supplements and nutritional changes. Some of the supplements that have been shown to halt the progression of dry macular degeneration include omega-3 fatty acids, beta carotene, zinc, and vitamin C. These nutrients and other antioxidants preserve vision and prevent further damage from dry macular degeneration. 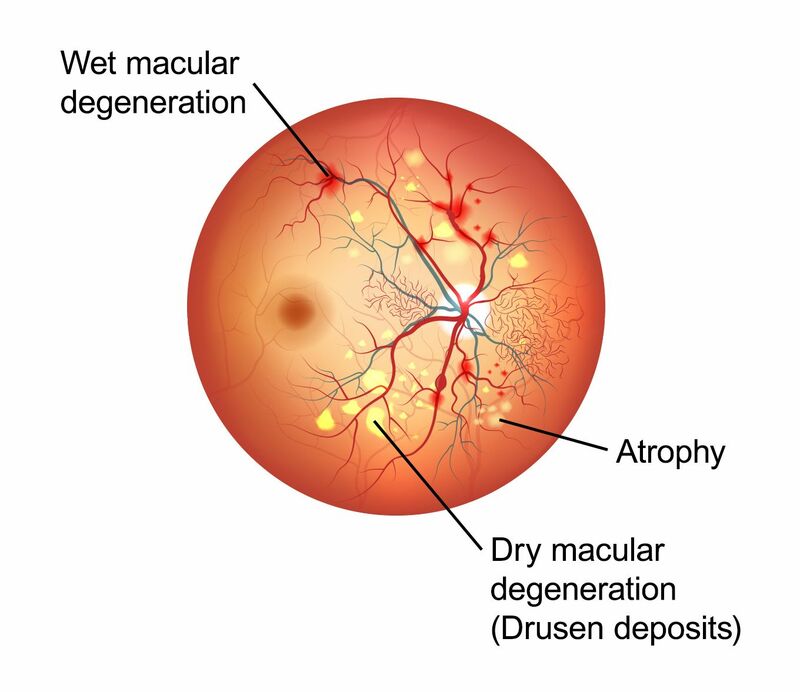 Wet macular degeneration: Wet macular degeneration is a condition in which blood from irregular blood vessels leaks into the eyes and causes swelling of the macula. This condition is treated differently than dry macular degeneration. Wet macular degeneration will be treated either through angiogenesis modulator injection therapy or laser therapy. Injection therapy uses vascular endothelial growth factor inhibitors to stop bleeding in the eye, while laser therapy cauterizes leaking blood vessels to prevent further damage. Our doctors will thoroughly examine our patients’ condition and recommend an appropriate treatment plan that will address each of our patient’s unique needs and prevent the progression of macular degeneration before further damage occurs. If you have noticed changes in your vision, it is important to seek professional eye care treatment as soon as possible. Our team of experienced eye doctors at EyeCare 20/20 offers a comprehensive range of eye care services, including diagnosis and treatment of the most common eye diseases. To learn how we can help you preserve clear vision and good eye health, schedule an appointment at your earliest convenience.